Dear Lara, What Do I do? Dear friend, today, I introduce to you a tool that will help you overcome your relationship fears and worries. We are living in a time when heart aches like depression, loneliness and divorce are wrecking many lives and unions. Lara Kudayisi-Emeralds is a relationship coach who is passionate about seeing people be in real relationships and enjoy connubial bliss, has sacrificed her time and resources to pen and publish this book in other to save us the cost of going through the ugly experiences many people go through which some are not alive to tell the stories due to death from cardiac arrest, migraine or suicide. This book is an effective relationship panadol. This book by Lara is a true life companion. It is sagaciously written to equip, empower and rightly position you for success in relationship. I call this book a cutting-edge marriage manual. Good news: This book is very affordable and easy to read. Guess the price? N1500 (One thousand five hundred Naira only). This book is one of the wise investments you will make now because it contains timeless and valuable truths that will help you be your best and attract the right partner your heart desires and also make your union forever fresh. Note: This book is for both Singles and Married. 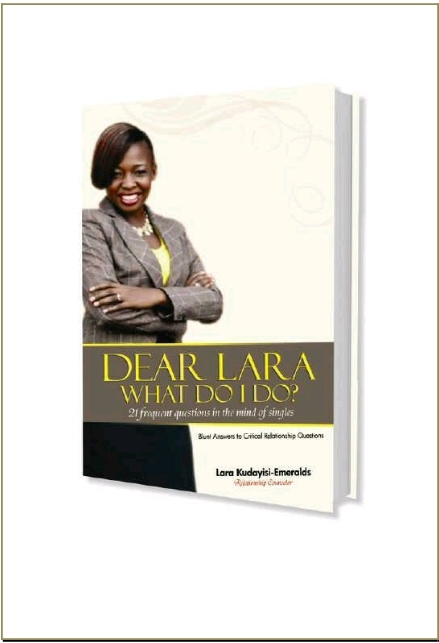 Lara Kudayisi-Emerald is a great shero and have birthed this book via her life’s experiences, insights gained from mentors and interactions with singles and married that she coaches, mentors and meet day to day. I read this book with keenness and must confess is a great treasure and tool for having a fulfilling dating, courtship and marital life. This book is the midas touch you need to move from friend to fiancé/fiancée. This book is a red card to divorce and heart aches in relationships. I commend Lara for writing this book and I advice you get your copy and also buy one for your love one. To order and get your copy, visit http://Shatteredglassng.com and let me whisper this secret only to your ear: if you mention my name to Lara that you want to buy, you get a discount of N200 (Two hundred Naira). What are you waiting for? Rush now and get a copy of this eBook and learn successful relationship trade secrets. Ifeanyi Enoch Onuoha is a life-betterment coach, passionate writer, internationally recognized book reviewer and voice of transformation who uses his sagacity in helping individuals and organization make better life, living and legacy.